Encompassing sculptures as well as performative interventions, video pieces, and graphic art, the work of Toni Schmale scrutinizes social power relations and a hegemonic society’s stereotypical gender roles, which she counters with gender-political utopias served up with characteristically sly humor masking radical dauntlessness. 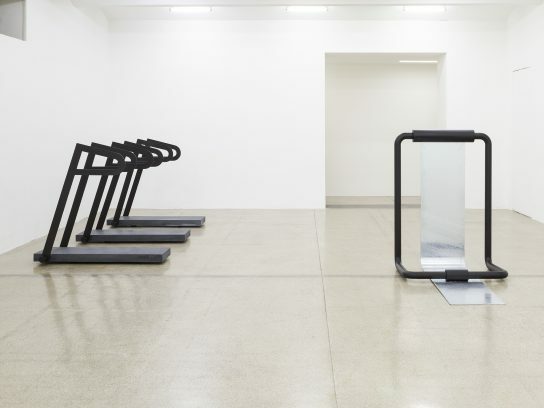 Her metal, concrete, and rubber sculptures have the air of a fleet of dysfunctional machines while also calling up associations of fitness equipment and torture instruments, surveying a wide terrain crisscrossed by desires, from the yearning for physical perfection to practices of sexual gratification. In her exhibition HOT HOT HOT, Schmale presents a series of new sculptural works she describes as “transitional objects”, an idea lifted from the theories of the psychoanalyst Donald Winnicott, whose work the artist has studied extensively. 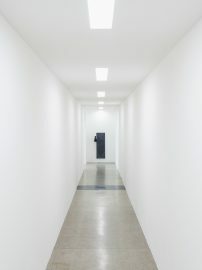 She is interested in the peculiar something that is part neither of the self nor of the other, instead marking a connection between the inner world and outward reality. An architectural intervention lends emphasis to the idea of transition: a long, empty corridor stretches before the visitor; at its far end, an opening on the left leads into the brightly illuminated gallery with the ensemble of sculptures – a gradual approach to the work staged as an extended intro. 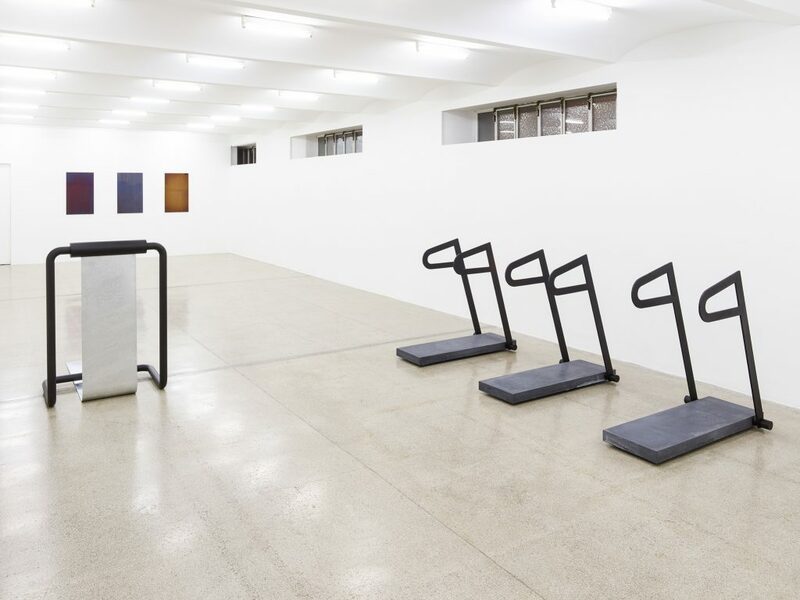 Visual echoes of treadmills or strength training equipment, though the formal vocabulary is simplified and abstract, and the placement of the objects in the gallery space bring the various stations at a gym to mind. Titles such as dipstation, ach ach ach, hot hot hot, and das management reinforce this loose-knit narrative of a workout. One characteristic feature of the ensemble is the palpable interconnectedness of the objects. The semblance of communication between them derives from affinities and variations of material and form, from ostensible repetition and subtle deviation. 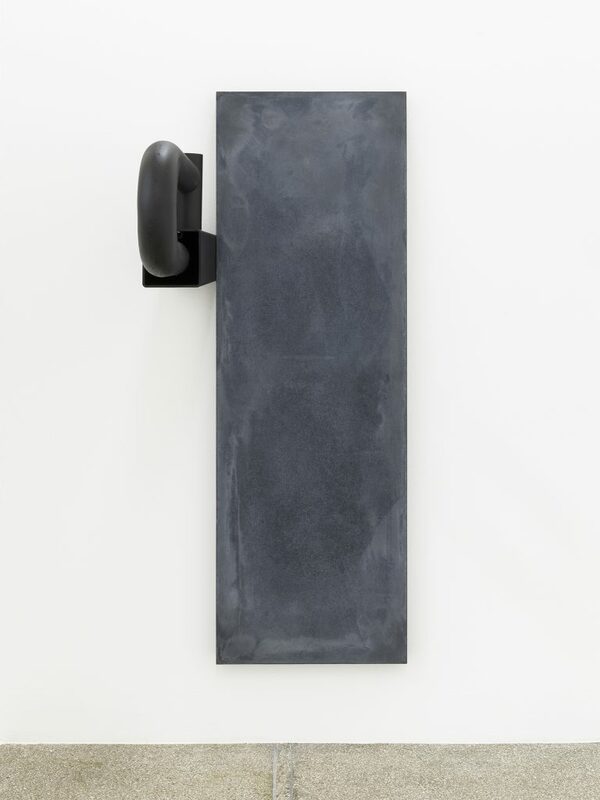 Surface treatments such as sanding and burnishing effectively conceal qualitative differences between materials; the objects, moreover, mimic each other, tune in to each other, most markedly in the motif of the doppelganger. 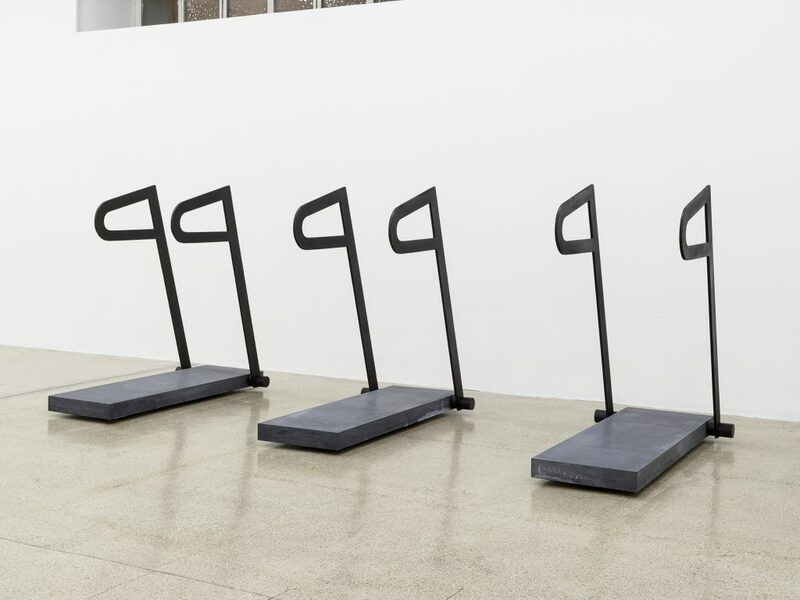 Deeply aware of the power of repetition, the artist, a former competitive athlete, deftly plays with monotony. 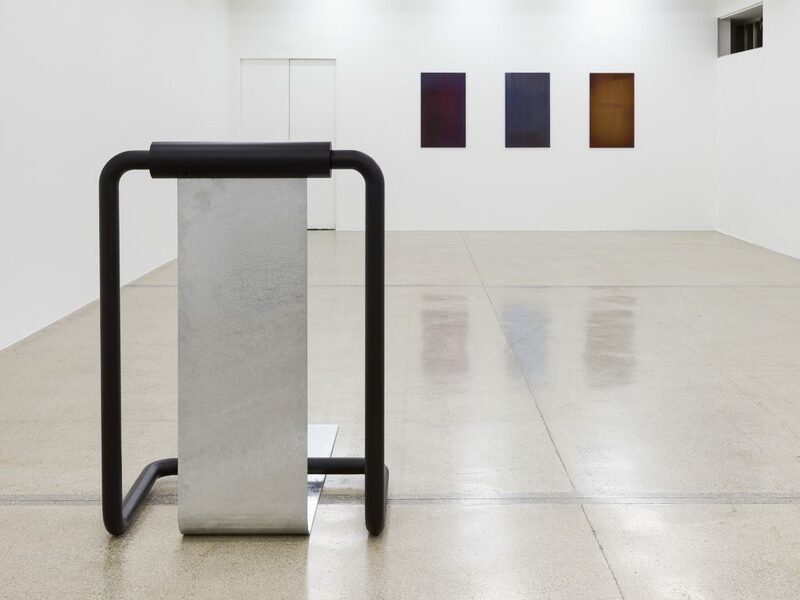 Yet all similarities notwithstanding, each object still has its own identity, a distinctive character, resulting in a certain tension when they share the stage. 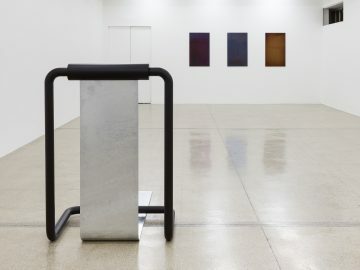 The exhibition’s title is a multifaceted allusion to the process of making the works: generally, to the very high temperatures required in metalworking or the act of heating an object. More specifically, to the “tempering” of metal, a process in which heat hardens the material. Depending on the duration and temperature, the metal takes on a different color, from yellow to red and a bluish purple. 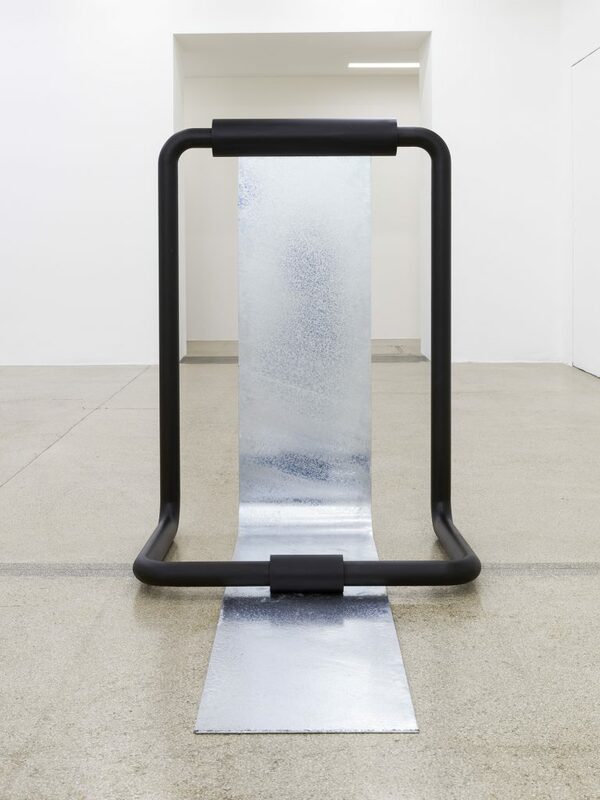 This superficial alteration results from a structural modification of the material’s properties and speaks to the stress to which it was exposed. 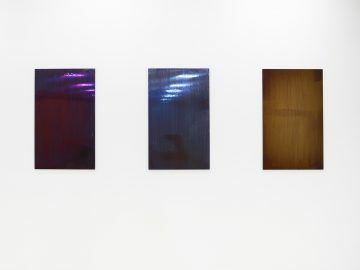 In industrial metallurgy, these outcomes are avoided – not least because the discoloration renders the metal more prone to corrosion, making it useless for commercial purposes—but to Toni Schmale they are of creative interest. 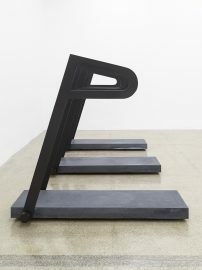 In her artistic interpretation of the idea of the transitional object, Schmale accordingly attaches great importance to the highly sophisticated construction of her sculptures: each is composed of multiple small parts held together by invisible push-fit connections. This mode of construction enables the artist to manipulate the heavy objects made of stainless steel, other metals, and concrete without assistance if need be—they adapt to the skills of the individual creator. Toni Schmale, born in 1980 in Hamburg, lives and works in Vienna. 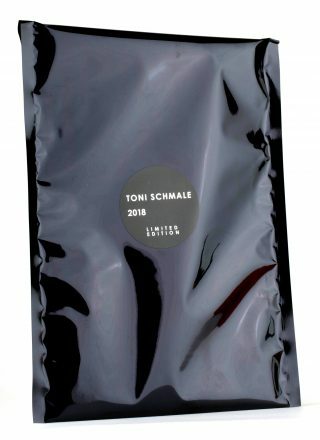 TONI SCHMALE 2018 is a locker calendar designed by the artist in collaboration with the artist and fashion designer Wally Salner and the photographer Maria Ziegelböck. 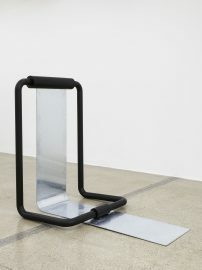 It is published in a limited edition on occasion of Schmale’s exhibition HOT HOT HOT.